When the Kansas City Royals lost in Game 7 of the 2014 World Series, against the San Francisco Giants, the entire team was locked into the 2015 season and making it back to the World Series. When the New York Mets finished 2014 with a disappointing 79-83 season and a post-season drought of eight years, very few within the team could imagine they’d get to the post-season, let alone the World Series. And that was the deciding factor–a team with World Series dreams vs. a team just looking to finish above .500. 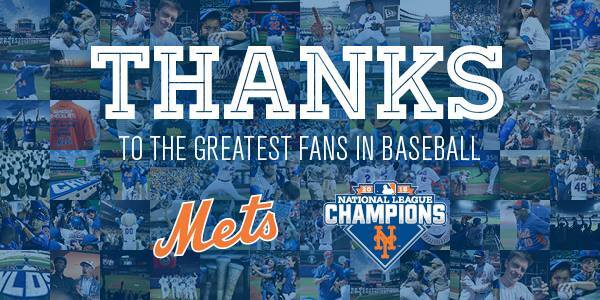 And with that, I cannot be more proud of my New York Mets. Because with no expectations, from literally anyone in baseball, the Mets scraped together a team that finished with 90 wins, a National League Pennant and the experience of being in a World Series. There’s much more to talk about in future posts, like what the Mets can do in the off-season to strengthen the team and what we learned about the makeup of this team, including its future potential for a post-season win. For now, let’s just remember the simple fact that the Mets weren’t being groomed for a World Series bid, but they made it there anyway. With a World Series under their belt and a young team that’s ready to make some moves during this long Winter, Mets fans should have nothing but hope for 2016. Let’s Go Mets! And THANK YOU! Chase Utley’s intent was clear when he “slid” late and aggressively into Ruben Tejada – he wanted to disrupt any chance of a relay throw and break up a double play. His intent is clear because he said as much during a post-game interview. His skewed regard for the MLB guidelines, on how to legally break up a double play, is also clear. Even the consequences of his tackle are crystal clear: Ruben Tejada won’t be playing post-season baseball in 2015, with a fractured right fibula (see video of “the slide heard round the world” below). What’s not clear is what the umpires and the MLB reviewers in NY were thinking when they overturned the original ruling and called Utley safe. The original call was an out, which is why a downed Tejada didn’t make a tag in the first place – that and the fact he couldn’t even move his right foot. This would mean the original call was in line with the neighborhood play, there to protect an infielder – attempting a double-play, relay throw to first – to not get hurt, like Tejada did. A neighborhood play is not reviewable and that is where it should have ended. Instead, things got weird. The play did end up getting reviewed, which is against the MLB rulebook, because the play was ruled a force throw to first and not a double play. Basically, the MLB NY office reviewing the play decided Tejada couldn’t have made the double play and so the neighborhood play wasn’t valid. Tejada never touched the bag nor tagged Utley. But Utley never touched the base, either. Furthermore, everyone on the field treated it like a double play: from Murphy’s toss to Tejada to Tejada’s attempted relay to first and to Utley’s acknowledged attempt to break up the play. Everyone thought it was a double play…except for the people who apparently matter: someone 3,000 miles away looking at it from a video screen. Let’s get something straight for the people who are saying, “Quit whining! It’s Baseball.” It is baseball, and a guy’s leg is broken. This isn’t hockey or football or rugby – it is baseball. No one should be getting their legs broken fielding a ball to second. But they do and not because the MLB needs to look at ending aggressive slides into the fielder. The MLB does not need to bring in a new rule; they just have to enforce the rules already in play. We can all agree that there is a human aspect to the umpire calls – a ball is called a strike; a player is called safe running to first base, instead of out; a fair ball is called foul to save a no-hitter. In baseball, rules are made to be broken…not the player’s bones. MLB: enforce runner interference on the double play. If you tell Utley to teach kids to slide on second base? Would he teach them the way he slided tonight? Let’s agree that as parents and coaches, we won’t teach the next generation of baseball players to win like the Chase Utleys of the world.